I Have a Great Savior! Lesson 1 in "Overcomers"
We all like to receive nice gifts. God has the best gifts of all and He wants to give them to us. They all come to us through His Son, the Lord Jesus Christ. There are four steps by which we receive the wonderful things God has for us: 1) the work of Christ, 2) the Word of God, 3) our belief, and 4) the work of the Holy Spirit. Let us consider these. The Lord Jesus died on the cross for our sins and He rose again to be our great Savior. His work is perfect and complete. In the Bible, God tells us what Christ has done for us. This is my part—to believe what God says in His Word. When I believe God's Word, the Holy Spirit makes real in me what Christ has done for me. This is the way we receive things from God. How did I become a child of God? First, there was Christ's work. He died on the cross for my sins. Then, there was the Word of God. In His Word, God told me what Christ had done for me. I believed what God said in His Word, and through the work of the Holy Spirit, I became a child of God. This is the way we receive things from God—by believing Him. God has many wonderful gifts that He wants to give us. They all come to us through the Lord Jesus Christ. That is why it is so important that we learn all we can about Him—who He is and what He has done for us. Jesus Christ is the great Creator. 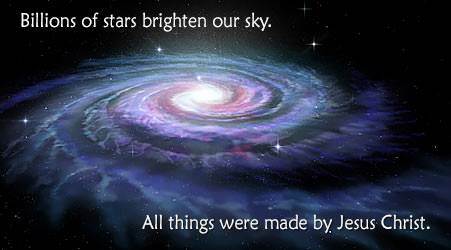 This verse tells us that the Lord Jesus created all things, including the universe. How large is the universe? No one but God knows. The universe is filled with stars. Our sun is actually a large star, but there are many other stars that are much larger than our sun. Some stars are so large that they make our sun look like a speck of dust in comparison to them. 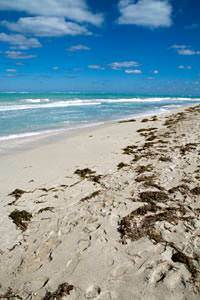 To get an idea of how many stars there are in the universe, we might go to a beach with miles and miles of sand. Suppose we filled a bucket with sand. How many grains of sand would be in that bucket? Probably millions! How many grains of sand would there be in that whole beach? Trillions and trillions! How many stars are there? Scientists have estimated that the number of stars in the universe is more than ALL the grains of sand on ALL the beaches of the world! Jesus Christ is the great Savior. 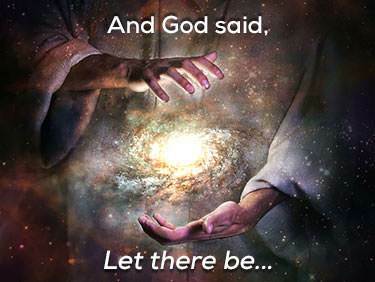 Here is a most amazing fact: The great Creator, Jesus Christ, the Son of God, once came into this world as a tiny baby! Why did the Lord Jesus come into the world? He came to save us from our sins. He came to be our Savior. The most precious story in all the Bible is the story of how God's Son loved us so much that He left His home in Heaven to come into the world to die for our sins. God showed His perfect satisfaction with Christ's death on the cross for our sins by raising His Son from the dead. Jesus was in the tomb for three days, but on the third day, He rose from the grave with a glorious, new resurrection body—a body that can never die. Jesus Christ is the mighty Victor over sin, death, and Satan. 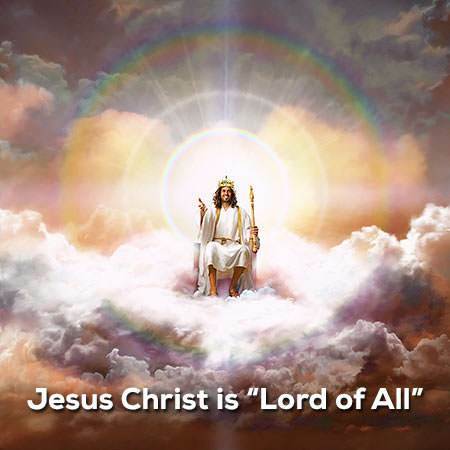 Jesus Christ has the highest place in Heaven. When the Lord Jesus returned to Heaven in His glorious, resurrection body, God the Father gave Him the place of highest honor. The position which God has given to His Son is far above that of anyone or any power in the whole universe. The Bible says that God has put all things "under His feet." This means that every person and every creature in Heaven and earth is under His authority. God has declared that the name "Jesus Christ" is to be honored above any name in the universe. Christians are in on a secret that the unsaved people in the world know nothing about. What is the secret? It is this: Jesus Christ has been exalted to the highest place in the universe. 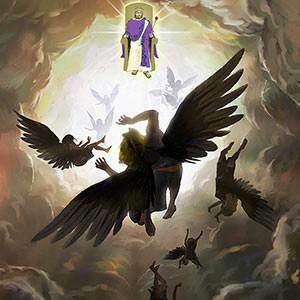 He is "King of Kings, and Lord of Lords" (Revelation 19:16). I have a Savior in Heaven! 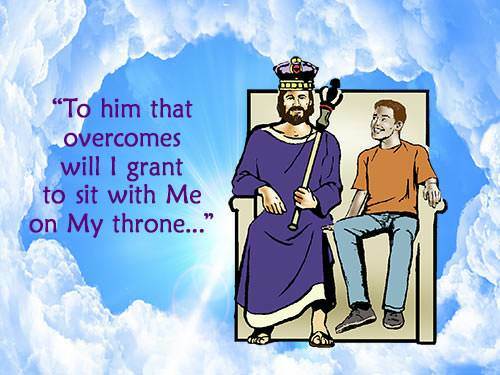 Right now, at this moment, the Lord Jesus Christ is sitting at the right hand of God the Father. Jesus has all power in Heaven and earth. He is my Savior and my Friend, and He is for me! 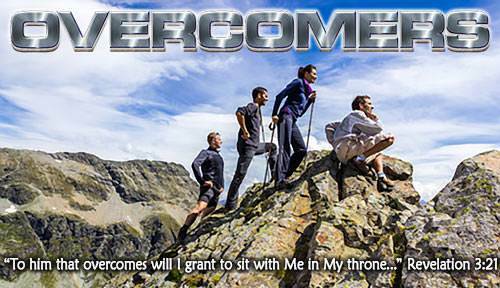 Be an "overcomer" for Christ. 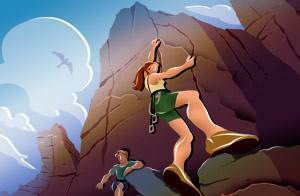 A group of young people decide that they will go mountain climbing. By the time they reach the foot of the mountain, some decide that they are too tired. They turn back. The others start climbing. The path is rough and steep. There are bushes and briars in the way. Halfway up, some decide that it is just too hard. They turn back. But some will not turn back. Up, up, and up they climb, until they reach the very top. They are "overcomers"! The Christian life is like this. It is a long journey and, at times, the way is hard. Jesus never said that it would be easy, but He knows the way and He has promised to be with us. He said, "…In the world you shall have tribulation [trouble]: but be of good cheer; I have overcome the world" (John 16:33). The Lord Jesus was an "overcomer." He came to do the will of God. He would not turn back. He did what God wanted Him to do. You and I can be "overcomers" by doing what God wants us to do. Jesus is for us. He has promised to be with us every step of the way. He said, "…I will never leave you, nor forsake you" (Hebrews 13:5). NOTE: At the end of each lesson we will have two sections for "overcomers." One will be "God's Truth"—what we have learned in the lesson. The other will be "I Believe." Read both sections carefully. If the prayer expresses what is in your heart, pray it softly to the Lord. Jesus Christ, the Son of God, is my great Savior. He has all power in Heaven and on earth, and He is my Friend. He loves me, He is for me, and He will always be with me. 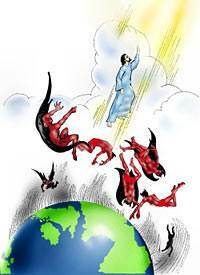 "Lord Jesus, I believe that You are now sitting at the right hand of God. You are my great Savior and my Friend. I want to be an overcomer. Please help me to be all that You want me to be."